Master Printer Cole Rogers with Jennifer Roberts, Faculty Director for the Arts, and Meg Rotzel, Arts Program Manager of Harvard’s Radcliffe Institute for Advanced Study. 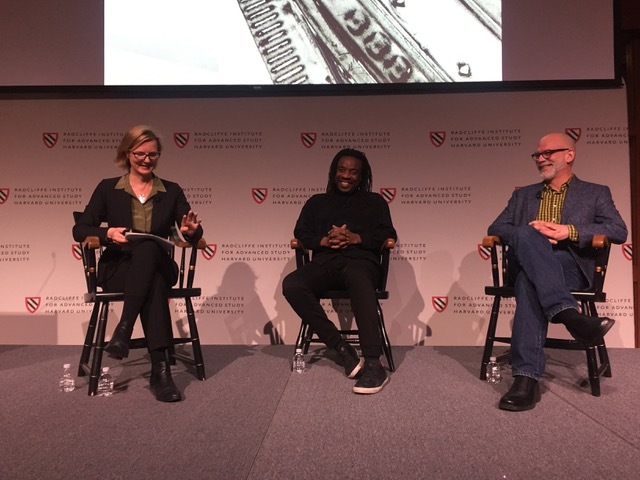 Highpoint Editions has been working with Jennifer Roberts, Faculty Director for the Arts, and Meg Rotzel, Arts Program Manager of Harvard’s Radcliffe Institute for Advanced Study to curate the largest exhibition of Willie Cole’s Beauties outside of Highpoint’s gallery. From March 27 - June 29th 2019. Radcliffe will showcase a total of 25 prints by Cole, all printed with Highpoint Editions. Roberts will also be publishing a book with a large portion dedicated to this work. Primarily a sculptor, Willie Cole draws his subjects from personal iconography: in his past work irons recalled African tribal markings and shields, ironing boards represented slave ships, and numerous images are drawn from a history of domestic labor and other personal references. Watch the opening night discussion with Jennifer Roberts, Willie Cole, and Cole Rogers here..
Cole Rogers, artist Willie Cole and Christina Taylor, Assistant Paper Conservator, Straus Center for Conservation and Technical Studies at the Harvard Art Museums discuss The Five Beauties suite. Willie Cole and Cole Rogers with high school students who attended the opening night. Jennifer Roberts, Willie Cole and Cole Rogers in discussion, opening night.